Families should be able to rely on provincial (and federal) legislation to provide minimum standards for keeping children and youth safe in all aspects of community life. This includes employment standards if they enter the workforce and protective legislation to keep the physical environmental clean and healthy for growing bodies. All provincial legislation and policy should prioritize the immediate and long-term best interests of BC’s children and youth based on the research evidence of potential harms and hazards. Child and youth rights and well-being should not be an afterthought or subordinate to powerful economic interests. In 2003 the BC government amended the Employment Standards Act to lower the BC work start age to 12 and removed the role of the Employment Standards Branch in issuing work permits for children 12 to 14. WorkSafe BC’s data showed a ten-fold increase in accepted injury claims for 12 to 14 year olds over a four-year period after the change in legislation. BC is the only Canadian province that does not set out in law or regulation the occupations, tasks, or time of day (other than during school hours) for the employment of children. 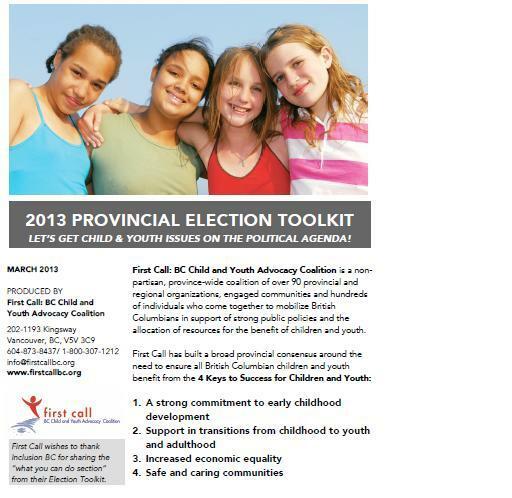 Q: If elected, will your party raise BC’s work start age back up to 15 and improve legislative protections and enforcement for children in the workforce? Over 100 studies have linked pesticide exposure to both adult and childhood cancers. Children are especially vulnerable to the effects of pesticides because they are closer to the ground and their bodies are still developing. Q: If elected, will your party bring in a province-wide ban on the sale and use of cosmetic pesticides? Increasing rates of obesity among children is one of the priority issues affecting children’s health. 26% of Canadian children are now classified as obese or overweight. Health organizations like the BC Healthy Living Alliance are calling for governments to tax sugar- sweetened beverages because research shows youth are big consumers of sugary drinks and increased taxes on them will reduce consumption. Content analyses of television advertisements have shown that food is the most frequently advertised product category on children’s television, and the majority of these ads target highly sweetened products and are increasingly promoting fast food meals. BC children should be protected from the marketing of products that jeopardize their health. Since 1980, Quebec’s Consumer Protection Act has prohibited commercial advertising intended for persons under 13 years of age. BC could do this too. Q: Are you in favour of amending BC’s Business Practices and Consumer Protection Act ot prohibit commercial advertising directed at children under 13 years of age? Q: Are you in favour of an additional provincial excise tax on sugar-sweetened beverage products?